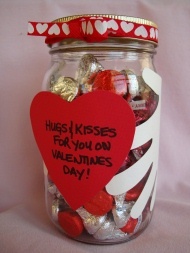 Give a special someone this adorable Hugs and Kisses Jar. Fill the jar up with kisses and all you need is a child's' hand prints to make the 'hug' and you've got a really special gift! Great for Valentines, Mother's Day, or for any special someone! 1. From construction paper, trace and cut out two hand prints and a heart (heart shaped cookie cutters make great stencils to trace around). 2. Glue your hand prints onto your jar, making sure you leave enough room for your heart at the front of your jar. 3. Write a special message on your heart, something like: "Hugs and Kisses for you on Valentine's Day", or, "Hugs and Kisses for you on Mother's Day". Glue your heart between the hand prints on the front of your jar. 4. Fill your jar with kisses. If you have a small piece of ribbon you can tie it around the lid for an extra special touch. If you don't have a jar lying around the house you can find a 'canning' jar at your local craft or discount department store for under $1, or check out your dollar store!